Today I found out the pharmaceutical company Bayer coined the name “Heroin” and marketed the drug as a non-addictive cough medicine, among other uses. While opium itself has been commonly used since at least 3400 BC, heroin is a relatively new invention, derived from opium. Heroin, more technically known as diacetylmorphine, was first synthesized in 1874 by chemist Charles Romley Alder Wright, working at St. Mary’s Hospital Medical School in London, England. He discovered the drug after playing around with mixing morphine with various acids. Specifically, he created it after boiling acetic anhydride with anhydrous morphine alkaloid for a few hours, which resulted in what we now commonly call heroin. After running a few experiments with it on animals, though, he abandoned his work on the drug. Twenty three years later, a man named Felix Hoffman, working at Bayer, in Germany, managed to independently synthesize Heroin when he was trying to produce codeine. This new derivative of opium was found to be significantly more potent than morphine and so Heinrich Dreser, head of the pharmacological laboratory at Bayer, decided they should move forward with it, rather than another drug they had recently created (Aspirin). It should be noted that Dreser was apparently well aware of Wright having synthesized Heroin 23 years before, but despite this, he claimed heroin was an original Bayer product and by early 1898, they began the animal testing phase of the product, testing it primarily on rabbits and frogs. They next moved on to testing it on people, primarily workers at Bayer, including Heinrich Dreser himself. After successful trials, Heroin was presented to the Congress of German Naturalists and Physicians as more or less a miracle drug that was “10 times” more effective than codeine as a cough medicine and worked even better than morphine as a pain killer. He also stated that it had almost no toxic effects including being completely non-addictive. Dreser particularly pushed Heroin as the drug of choice for treating asthma, bronchitis, tuberculosis, and phthisis. If it seems odd to you that he should push Heroin as a cough medicine, over its pain killing effects, it should be noted that at the time tuberculosis and pneumonia were among the world’s leading causes of death and one of the leading methods to treat this was using codeine, which is fairly addictive given regular use. Because Heroin worked well as a sedative and respiration depressor, it did indeed work extremely well as a type of cough medicine and allowed people affected by debilitating coughs to finally be able to get some proper rest, free from coughing fits. Further, because it was marketed as non-addictive, unlike morphine or codeine, it was initially seen as a major medical breakthrough. Just one year after its release, Heroin became a world-wide hit, despite it not actually being marketed directly to the public, but rather simply to physicians. Heroin was soon sold in a variety of forms: mixed in cough syrup; made into tablets; mixed in a glycerin solution as an elixir; and put into water-soluble heroin salts, among others. At the end of this first year, it was popularly sold in over 23 countries with Bayer producing around one ton of it in that year. Obviously, it quickly became apparent that Bayer’s claims of the drug not being addictive were completely false, with reports popping up within months of its widespread release. Despite this, it continued to sell well in the medical field. 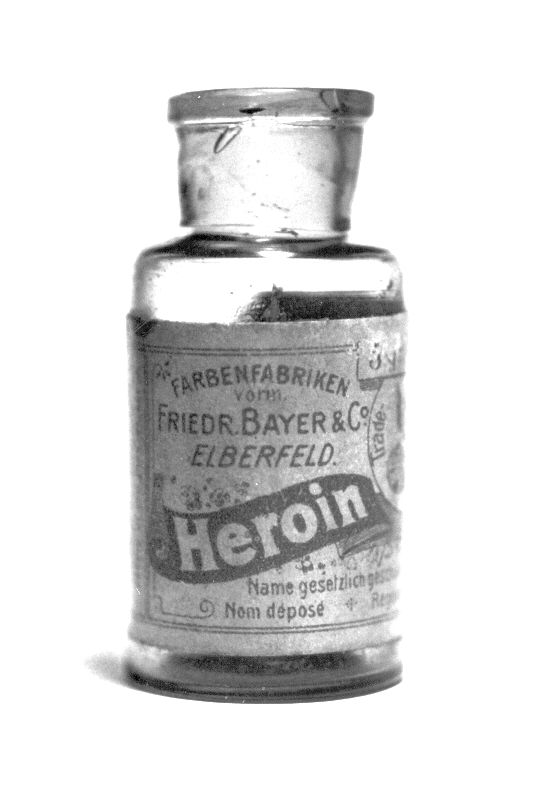 Finally, in 1913, after the number of Heroin addicts began to skyrocket and it became likely that it would shortly be banned in many countries, Bayer decided to stop producing the drug. The originally trademarked name of Heroin is thought to derive the German word “heroisch” (heroic), due to the way the workers who tested Heroin on themselves reported that it made them feel. Bayer ultimately lost the trademark for Heroin in a few key markets at the same time they were forced to give up their trademark on Aspirin, thanks to WWI. During WWI, Bayer’s assets, including their trademark rights, in the U.S. and the Triple Entente allies (UK, France, and Russia) were confiscated and it became common to simply refer to all brands of the drug as “Aspirin” in those countries, among others. Finally, after the signing of the Treaty of Versailles, Bayer officially lost their trademarks on Heroin and Aspirin in the U.S., France, Russia, and the UK. Interestingly, one of the common early uses of Heroin was to help treat people who were addicted to morphine, even though Heroin ultimately proved to be more addictive. Humorously, when morphine was first isolated from opium in 1805, one of its early uses was as a “non-addictive” drug to treat people who were addicted to opium. Felix Hoffman didn’t just help introduce Heroin to the world, in 1897, he also was one of the first people to synthesize a version of something called salicyclic acid. His version, though, didn’t have the extreme negative stomach pain side effects normally associated with that particular chemical. “His” drug, acetylsalicyclic acid, is more commonly known as aspirin. Hoffman was not technically the first to synthesize aspirin. That distinction goes to French chemist Charles Freferic Gerhardt who did it in 1853. However, Gerhardt’s method resulted in an unstable and impure form of aspirin. Hoffman’s method had no such deficiencies, though others had also managed to achieve this feat before Hoffmann (resulting in numerous lawsuits being filed against Bayer over this after they introduced Aspirin). The salicyclic acid aspirin is derived from actually has been used for medicinal purposes for thousands of years. This chemical is naturally found in the bark of a Willow tree. Indeed, Hippocrates himself somewhere between 460 BC and 377 BC described a powder from the Willow tree used to treat symptoms such as headaches various types of pain, fever, etc. When aspirin was first recommended to Dreser for Bayer to move forward with, he rejected it, stating “The product has no value”. Today, over 40 billion tablets of aspirin are consumed annually. Once Heroin’s star began to fall as people began to realize how addictive it was, he revisited his decision on Aspirin, which quickly became Bayer’s best selling product. After Heinrich Dreser left Bayer, he once again is thought to have picked Heroin over Aspirin, this time to his doom when he eventually died of a stroke. It is rumored that in his waning years, he began taking heroin daily, rather than aspirin, to treat his health problems. What is ironical about this, of course, is that a daily dose of aspirin may well have prevented his stroke. Both morphine and codeine were isolated from opium in the same year, 1805, with morphine being reported to be about ten times as potent as opium itself. As such, it quickly became one of the more popular medicinal and recreational drugs in many places in the world, particularly the United States where it was used very commonly as a pain reliever. When heroin is orally ingested, its effects are drastically reduced due to the fact that it is converted to morphine when it is metabolized by your body. This may partially explain why the addictive effects of heroin were not instantly apparent, as is often the case with modern methods junkies use to partake in this drug which result in it being able to cross the blood-brain barrier extremely quickly. Today there are an estimated 15-20 million people who are addicted to heroin. While heroin is outlawed in most countries in the world, it is still not so uncommonly used medicinally in the UK for treating various things such as for post-caesarian section and other post-surgery pain. It’s also used to help relieve pain in cancer patients and for others who have chronic pain. However, in recent years this usage has begun to tail off, in favor of other drugs, such as morphine. Today, medical use of heroin in the UK accounts for an estimated 95% of the legal usage of heroin in the world. Aspirin is thought to have significantly contributed to the death toll in the 1918 flu epidemic due to the fact that high doses of aspirin can be toxic and these high doses can lead to fluid build up in the lungs, upping the chance of infection. Bayer had their legacy significantly tarnished during WWII when they became part of the Farben German chemical company conglomerate that is known to have used slave labor during WWII, including managing slave labor camps. Further, Farben was the group that manufactured Zyklon B. Why is this important? Because Zyklon B was the cyanide based pesticide used in the Nazi gas chambers. Bayer was forced to separate from Farben after WWII. Bayer currently grosses around $45 billion per year, with about $2 billion per year of that as profit. They also have well over 100,000 employees. IG Farben was a part of a massive Jewish conglomerate which included AGFA and Standard Oil. Standard was one of the companies which refused to halt any supplies to Germany or to increase production when USA decided to enter into the war.What was WW11 actually ‘about’…is an interesting study when one moves outside the deliberate falsifications. Fritz Haber of IG Farben invented the atrocity, mustard gas used in WW1. Haber was a jewish man and mustard gas was not ‘non jew specific’. His jewish wife,also a scientist but apparently one with some ethics morals and scruples, when finding out what he’d done, committed suicide. The vermin poison Zyklon was used in experiments on Russians and ‘others’ far more of whom were actually disposed-of than the jewish victims…who refused to be transferred to Palestine from 1934 onwards. Many thousands were betrayed to gestapo by others as the very amicable agreement between the Reich and leading zionists coming from the 1934 conference on ‘the jewish question’ was that Palestine was the only place to which German jews could go. Thus the abominations those tragic victims suffered were not a ‘holocaust’ but a German pogrom and a khazar zionist shoa. Between 1934 and 1939 Germany transferred at least 69000 zionists into the victim nation Palestine Germany built the zionists first bank, infrastructure and 42 kibbutz to train them and traded with them mostly in oranges. There they met no attacks in WW11 yet plotted against the British, offering the German Military that they would rout the British for them, in the Middle East. Nothing came of it or their anti-British/ terrorists group activities (later becoming the IDF) until after the war when they refused to comply with the British (who had had the Palestine mandate since 1920) restrictions on importing more jews. Then began the so far 68 years of mass murder of Palestinians. David Gruen (aka ben Gurion) and his cohorts never had any intention of complying with boundaries as is continued by every (faked name) PM…the latest psychopath being “Benji” Mileikowsky. it was an abomination that greeted the remaining jews, none of whom deserved their fate…Curiously with ‘5 million or so’ murdered Russians and ‘others’, the jewish toll has been reduced from an absurd 12 million to 6 Million….ensuring it kept it numerically ahead of the “Russians and ‘others”…who received little recognition and no special treatment or compensation. People trying to ascertain the true numbers are vilified and characterised. Brutes themselves, the Russian Government transferred from memory, some hundreds of thousands of German prisoners to work camps in Siberia…most died. I recall maybe I was about 20 when hearing that Russia had released the remaining few thousand….still it goes on, the Central Bankers and agents scheming wars in which we, the serfs, are expected to applaud and partake. The latest from 1991 onwards have been generated by Israeli disinformation, assassinations, lies and abominations in giving false witness to demonise Hussein and others…and look at the mess. A financial bonanza for the Central Bankers and a ruining of mankind and the environment. ISIL was a deliberate and intended outcome, with Hussein in power, they would never have got anywhere….so he had to be silenced and to ‘go’. The Kurds who were gassed ‘by Iraq’ so said, were from USA lethal gas…the receptacles proved it…. and the co-ordinates for the travesty were supplied by Israel..Who? are the real victims of what has been organised for the world by the Central bankers.